The record is made up of 1 volume (44 folios). It was created in c 1954. It was written in English. The original is part of the British Library: India Office The department of the British Government to which the Government of India reported between 1858 and 1947. The successor to the Court of Directors. Records and Private Papers. ( Trucial Coast The historic term used by the British to refer to the Gulf coast of Trucial Oman, now called United Arab Emirates. ) Limited. the limits now claimed by you if they are disputed by neighbouring Rulers. sea between Ras Sha'am and Bakhah and about 20 miles from Ras al Khaimah. 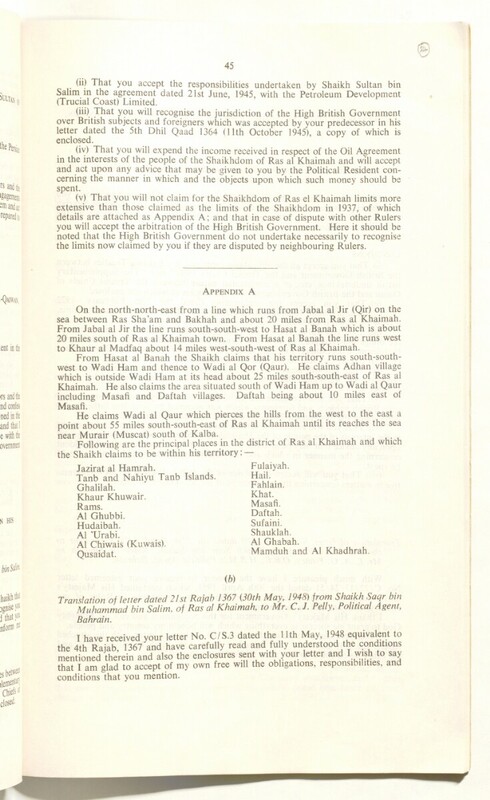 to Khaur al Madfaq about 14 miles west-south-west of Ras al Khaimah. near Murair (Muscat) south of Kalba. , ^ , j . . .
Tanb and Nahiyu Tanb Islands. The volume consists of the following Foreign Office document: 19127, marked 'For Official Use only'. The volume is divided into sections containing transcripts of treaties and engagements relating to Bahrain; Kuwait; Qatar; Trucial States; Muscat; and miscellaneous. The earliest treaties recorded date from 1820. There is a list of contents at the front of the volume. Foliation: the foliation sequence commences at 1 on the front cover and terminates at 45 on the back cover. These numbers are written in pencil, are circled, and can be found in the top right hand corner of the recto The front of a sheet of paper or leaf, often abbreviated to 'r'. page of each folio. An original printed pagination sequence is also present in the volume. Foliation anomaly: ff. 10, 10A. The following folio needs to be folded out: f. 39.